This Item is also available in ePub format. Covers tablet, smartphone, Android and iOS! 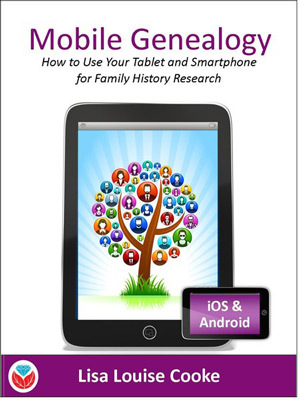 Is loaded with tips and tricks that make your mobile device a genealogy powerhouse! Finally - we have a great new guide for those of us who use mobile devices! This book takes the place of Turn Your iPad into a Genealogy Powerhouse, written by Lisa Louise Cooke in 2012. The iPad volume was becoming dated, and mobile devices of all kinds have sprung up since the publication of that book. Not only are folks using iPads & iPhones for genealogy, but many of us are using devices that run Android operating systems. I never felt the need for an iPad, but I've been using the iPhone and Android smart phones for years. I'm currently using a Samsung Android smart phone that I'm very pleased with. I use it for all kinds of genealogy applications. Access the Computer On Your Desk at Home! Chapter 15 covers using your mobile device to access your home computer. I'll bet most of you never even considered connecting to your PC with your smart phone. Yes - it's possible, and Lisa gives step-by-step instructions on how to do that too! So - whether you are using a tablet, or a smart phone, you can access stuff that's 1000 miles away - or maybe just around the corner. Screen Capture on my Smart Phone?! Chapter 4 really gets into the nitty-gritty of better browsing with your mobile device. Although covered in Lisa's 2012 iPad book, this chapter takes the subject to a whole new level. Her section on mobile web-clipping and screen capture was a great help to me. I've always had problems with screen capture and had basically given up on it. Now I know what to do! Lisa's section on translation strategies in Chapter 10 just opened up a world of new data for me - and it can for you. She explains how the Google Translate App from the App Store or Google Play can be used for capturing data on your ancestor from foreign-language books - translated into English so you can actually read it! Yes - we all know the shortcomings of translation programs, but I am happy to accept anything dealing with my ancestors, and the towns they lived in, even if the English is a bit messy. Think Google Books here folks - loaded with stuff on our ancestors, much of which we can't read! You can even use your phone's camera to capture, OCR, and translate any words or phrases! Lisa takes the reader step-by step through how to use the marvelous technology that's resting in your hand! Following is an expanded Table of Contents for the volume. Chapter 3: There's An App for That! Lisa Louise Cooke is the founder of Genealogy Gems, a family history oriented multi-media company. Since 2007 she has produced and hosted The Genealogy Gems Podcast, the #1 genealogy podcast in iTunes. As a technology expert she travels the world teaching family historians how to harness the power of tech to benefit their genealogy research and family history story-telling.